KATHMANDU, March 3: A day after the Election Commission (EC) enforced the election code of conduct, Prime Minister Pushpa Kamal Dahal has appointed vice-chancellors at four health science academies, breaching the code. The election code of conduct, which came into effect from Wednesday, bars the government from recruiting, promoting and transferring government officials until the local election are held. Prime Minister Dahal, however, appointed Dr Bharat Yadav the vice-chancellor (VC) of Patan Health Science Academy and Dr Rajendra Wagle the VC of Karnali Health Science Academy on Thursday. Likewise, Dr Raj Kumar (RK) Rauniyar has been appointed the VC of BP Koirala Health Science Academy, Dharan, while Dr Buddhi Bahadur Thapa the VC of Pokhara Health Science Academy. A committee led by Minister for Health Gagan Kumar Thapa on Monday had recommended three names for each position. Following the recommendation, PM Dahal, who is also the Chancellor of all the four academies, made the appointment decision a day after the election code was enforced. Asked about the EC's response to the crucial appointments made by the government, Election Commissioner Sudheer Shah said the election body will respond only after going through the government decision. "We have made an understanding not to halt the decision processes which were initiated before the enforcement of the election code," said Shah. Generally, the election code of conduct comes into effect right after the announcement of the election date. This time, however, the EC enforced the election code a week after the announcement of the election date. Taking advantage of the delay in the enforcement of the election code, the government had transferred 20 Deputy Inspectors General (DIGs) of Nepal Police, 35 Under-secretaries of the Home Ministry and 10 DIGs of the Armed Police Force. Election experts have criticized the government for the massive transfer of top security agencies and senior home ministry officials working in various districts as chief district officers (CDOs), arguing that such decisions could influence the upcoming local level elections. 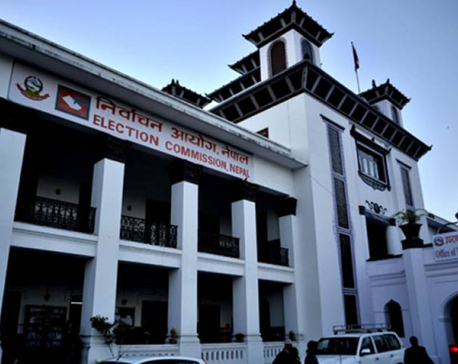 KATHMANDU, Feb 15: The Election Commission (EC) has asked National Assembly election candidates to submit details of poll expenditures soon.